I got an RSpec Story Runner (Cucumber) test passing with Glimmer code that tests whether a user logs in successfully. RSpec is a Ruby library that encourages BDD (Behavior Driven Development,) enabling you to drive the functionality of your application from the outside in by specifying the external behavior from the user's point of view and in the user's language. 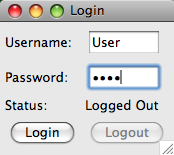 Then my status should become "Logged In"
It uses SWTBot behind the scenes to execute the scenario steps, such as filling in text fields and pressing the login button. In a future post, I will discuss the technical details of how this works. wow! Is it possible to test an existing Java SWT application with Cucumber and SWTBot? That's the point Nicolas. I gave my code to another developer who is testing out the idea. If I hear back from him about his results, I'll write a blog post about it. Whats the progress on this? I would like to use cucumber to drive my Java BDD. How do you use JRuby to instantiate java classes in Ruby to perform cucumber steps? I would be interested to see your SWTBot steps that you have written. I have some code that is not polished and needs extra setup to make it work on your machine, but I can commit anyways under the Glimmer project if you need it. I will let you know once I have done so.